Alexandre da Cunha's MIX (2012) is a new piece of public art commissioned by the Monsoon Art Collection for Notting Dale Village, home to Monsoon Accessorize. Notting Dale Village is an ongoing area of development located within an ex-industrial site between Latimer Road and the Westway flyover. Da Cunha was invited to conceive a new permanent work for the site, drawing on his existing interests in notions of monumentality, the relationship between public and gallery-based sculpture and the transformation of found materials. Da Cunha's sculptures and paintings typically play with and distort the concept of the readymade, encouraging us to reconsider our surroundings and the objects we think of as familiar. MIX (2012) embodies a continuation of these investigations and has offered da Cunha an opportunity to explore them in a public context for the first time. 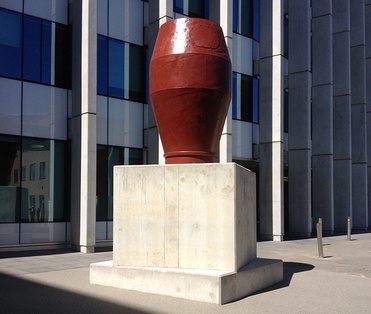 The work takes the form of a reclaimed concrete mixer drum which is placed on top of a distinctive concrete plinth. Materially, the work takes its point of departure from the site and the newly constructed buildings which use concrete as a primary material; the use of concrete also reflects on da Cunha’s own artistic heritage as a Brazilian artist, a country in which the material has played a significant role in both art and architecure. MIX plays with tropes of public art display, but primarily with the relationship between the plinth and object, the former traditionally functioning as support for the work of art. In MIX the concrete plinth, which consists to two twisted cuboid forms standing at 2.5m high, becomes equal in presence to the monumentally-sized concrete drum which looms above. In its twisted form, the plinth also gestures towards a functional role as a public seating area. The drum itself is reclaimed and is coated in red-oxide paint – the coating used to prepare metals for use in building projects. Located at a point central to the Notting Dale site, the work's presence will continue to shift as new buildings rise up around it over the next five to ten years. Pushing even futher the linguistic games present in the work, da Cunha's concrete drum, though stilled in its new sculptural form, will be the point around which Notting Dale Village slowly grows and circulates. Alexandre da Cunha (b. 1969, Belo Horizonte) lives and works in London. Recent solo exhibitions include Le Grand Cafe - Centre d'art contemporain, Saint Nazaire, France; Full Catastrophe, Thomas Dane Gallery, London; Kentucky Pied de Poule, CRG Gallery, New York (all 2012); Laissez Faire, Camden Arts Centre, London (2009). He recently participated in the 30th Sao Paulo Biennale.